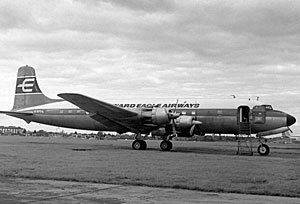 In October 1962 the then Cunard Eagle Airways together with most of the British independent airlines as they were called were chartered to carry soldiers to Norway for a NATO exercise. For us the departure airport was Exeter and I was crewed for this and so in the evening of the 12th October we as the crew under the command of Captain Holmes arrived with DC6 G-APON around 7pm. We repaired to an hotel in the city for the night with an expected wake up time of around 6am. The phone duly rang at the appointed time in the morning and the voice whose was the Captain said turn over and get some more sleep as Exeter Airport had fogged out. The fog lasted another 2 days but eventually cleared. On the morning of the 15th October we arose and headed for the airport. At 07.38 with 104 troops on board we took off for Bardufoss well above the Arctic Circle via Stavanger. We eventually arrived at Bardufoss at around 9pm. A new experience awaited us and that was landing on ice as winter had arrived at that latitude. Apparently this is quite normal in that part of the world. After taking rest at Bardufoss and having watched reindeer nibbling trees outside as we had breakfast we departed for the airport to fly back empty to Heathrow. Fog intervened again with Heathrow fogged out and we diverted en route and night stopped at Prestwick carrying on to Heathrow the next morning. A 36 hour away rostered trip turned into about 5 days all done on 2 shirts. The DC6 registered as G-APON that former Flight Engineer Phil Kelly crewed on a flight to Norway from Exeter.